Tennessee may have discovered another gem. 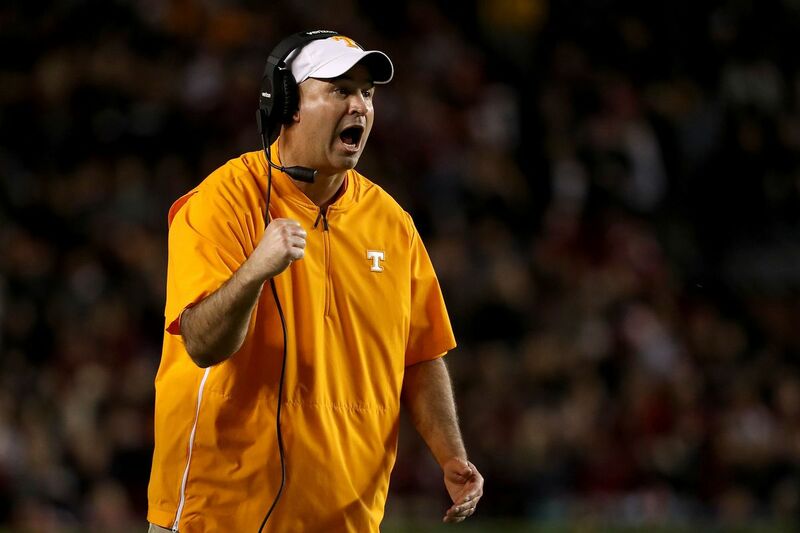 Jeremy Pruitt and his staff added another member of the 2020 recruiting class on Sunday. 3-star Georgia running back Jimmy Calloway officially announced on his Twitter that he committed to the Volunteers. Pruitt sent the confirmation tweet shortly afterwards. Admittedly, it wasn’t the commitment that many expected from the Orange and White Game weekend (more of those might be coming, however). Few had heard of Calloway before the game, and many are still wondering if he is truly a “take” for the current staff. Today, we look at Calloway’s tape and summarize what he’ll bring to Knoxville, and what the staff might see in his abilities. This will be an ongoing series as Tennessee’s 2020 recruiting class comes together. We will try to give a short analysis of each commit and what they bring to the table. Tennessee may have found another under-the-radar gem with Calloway. The name already has good history behind it at Tennessee, so maybe Jimmy can be the next in line for offensive highlights. Calloway plays at the 5A level of Georgia high school football at Morrow High School. According to his Hudl bio, Calloway was the 2017 Region 3-AAAAA Athlete of the Year and Clayton County Offensive Player of the Year. His tape shows him playing quarterback, wide receiver, kick returner, and cornerback. According to another interview, Calloway also serves as the punter. So his “athlete” categorization is indeed accurate. He’s more quick than he is fast, though a few plays certainly look more like the latter. His tape has multiple plays where he slices through a crowd of defenders with quick feet and some nice cuts. Surprising burst at the end of runs which propels him by the last defenders. Hard runner for his size. Vision is top notch, and it’s most evident on the kick returns. Calloway finds the smallest gaps and exploits them, and it almost always turns into a big play for his team. There’s also the concept of play speed vs. testing speed. Calloway clocked a 4.7 40-yard dash at The Opening Regional in Atlanta—which probably isn’t too far off from his play speed—but the burst in his tape looks better than that. It could also be the fact that he gets to his top speed quickly. Most upside is probably at wide receiver, with running back in a close second. Calloway doesn’t have pretty routes, but he has good hands and the necessary athleticism/quickness to be a deadly slot option. It would do wonders for his development if he could focus solely on the position that Pruitt and staff want him at. Truthfully, Calloway looks like a blue-chip type of player. He’s raw and needs refinement, but he has all the necessary tools to be a star at the next level. There’s a couple reasons he might be under-ranked. Firstly, his team isn’t that good. Any time a school has one player in five roles, chances are that he’s one of their only great players. They even missed the playoffs in the year that he won both the aforementioned awards. If he just recently started going to recruiting camps, that’s basically the only way a lot of the services would know about him. Secondly, it’s April. Rankings aren’t very good at this point and will be wildly shifting over the coming summer months. Now that Calloway is committed to a major school and is publicly known, recruiting services will have the chance to go over his film and reevaluate where they rank him. We should remind everyone that gaining a commitment isn’t a guarantee that you keep a commitment. That being said, Tennessee did their homework here, and hopefully it will pay off down the road. Rick Barnes making an in-home visit with PG Jalen Cone on Saturday Tennessee is coming hard after Cone. Tennessee makes top five for 2020 cornerback Andru Phillips A name to put on your radar. Tennessee set to face three teams in ESPN FPI Preseason Top Ten in 2019 Vols will have their work cut out for them once again in conference play. This Article has a component height of 19. The sidebar size is long.